These are my sanity-restoring baby booties. I’ve had the pattern written up for forever, I just needed to knit more samples. And then I knit the samples, but just needed to take pictures. And then I let the pictures sit, even though all I had to do was plop them into the pattern, convert to pdf, and upload. Oh, and update the web site. Which is done now, so I’m going to bed. While I sleep, you can download the pattern and knit some booties. 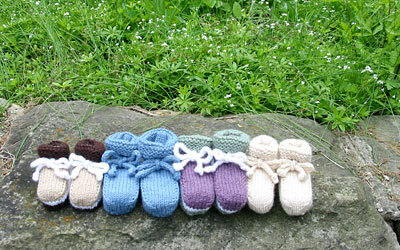 CogKnition posted this on July 12th, 2008 @ 1:43am in Baby Items, Finished Objects, Knitwear Design, Site Updates, Socks & Slippers | Permalink to "Wave of Babies Booties, Knitting Pattern Posted"